Boston Market Garlic Dill Potatoes may have been discontinued from the Boston Market, but you can still enjoy these when you make them at home. These classic garlic dill potato wedges remind me of good old fashioned cooking. This is dish is similar to what you grandmother might have made. Simple cooking is often the best type of food there is. 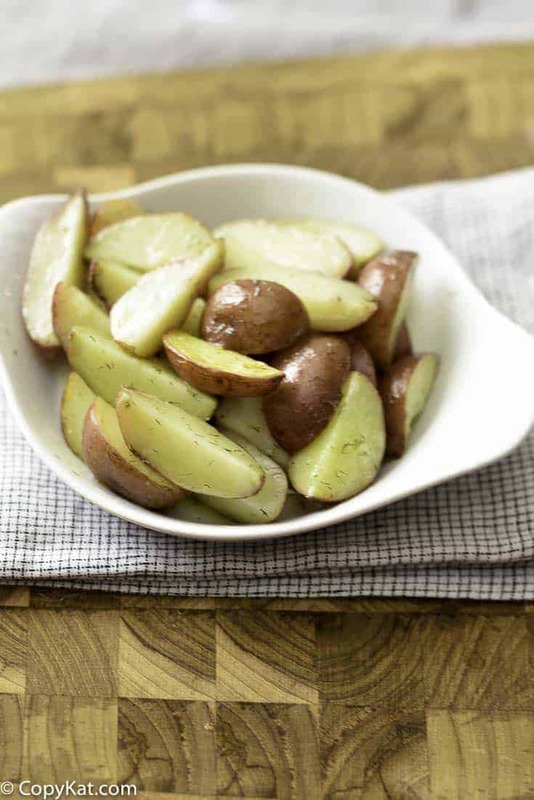 Here we let the fresh flavor of baby red potatoes sing out along with a touch of garlic and a hint of dill. For this recipe, I like to use red potatoes that are on the small side, something less than 2 inches in diameter is my personal preference. I love the flavor of these potatoes, and they also cook very quickly so you don’t have to worry about potatoes taking a long time to cook. If you have unsalted butter on hand you may want to use your unsalted butter and this way you can adjust the salt according to your personal preferences. 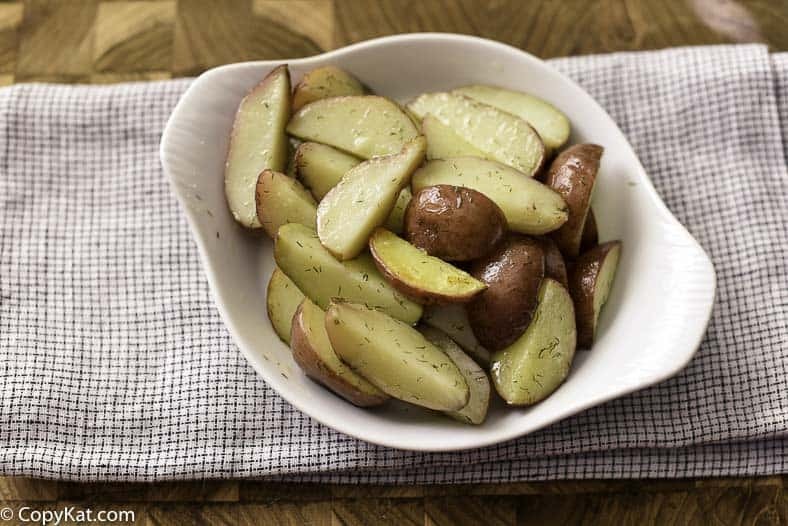 I know you are going to enjoy these Boston Market Garlic Dill Potatoes when you make them at home. If you love the Boston Market you may want to check out some of these other favorites. Make Boston Market Garlic Dill Potato Wedges at home. Wash potatoes well and boil until soft, drain well on paper towels. Melt the butter, in large frying pan (use only real butter) saute garlic for a couple of moments, and then add potatoes and the rest of the seasonings. Pan-fry the potatoes until they are lightly brown. Fresh is best, but dry is ok to use. Made as directed and I used med size red potatoes. This dish was not salty at all as listed in the recipe. Guess Rob never had Syracuse Salt Potatoes? That recipe calls for a whole lot of salt, which you never taste, bye the way, he would flip out!!! I believe “New” or red potatoes come in sizes small medium and large. It would be good if your recipe mentions the potato size. Thus, the quantities of the remaining ingredients were in doubt as I doubled this recipe. That said, I think the recipe is close to Boston Market potatoes recipe except for the salt. I was overwhelmed by how salty these potatoes were. My suggestion is to cut the salt and celery salt by at least half and consider specifying the use of unsalted butter. Thank you for your suggestions. I will see what I can do about the potato sizes, and I will take your other ideas regarding the salt into consideration. Delish! Thanks for creating and posting. I made these as the side for a pressure-cooker pot roast. Mmmm, family ate it all up!